The second wave adds another dimension to the LNG market. Over a span of several years, the global liquefied natural gas (LNG) export landscape has changed markedly. Early this decade, the industry was bullish about the prospects for large liquefaction projects in places such as Australia and the United States. Thanks to dramatic growth in domestic natural gas production, these two countries were positioning themselves to become major LNG exporters through a series of mega-projects proposed by Shell, Chevron, Cheniere Energy and other companies. It was a time of tight LNG supplies and escalating LNG prices, and these large projects were designed for a seller’s market. One could describe these facilities as the “first wave” of LNG export projects. Fast-forward to today and the LNG market dynamics are considerably different. In the short-term LNG supplies are abundant as these mega-projects go online, and LNG prices have moderated. As a result, LNG project developers are now focusing on a “second wave” of liquefaction terminals designed to make a profit in a buyer’s market. It is important to note that the first wave is not going away; rather, the second wave is adding a new dimension to the LNG market because it can cater to a broader range of buyers. One company riding the crest of this second wave of LNG export projects is NextDecade, which is developing the Rio Grande LNG project near Brownsville, Texas. 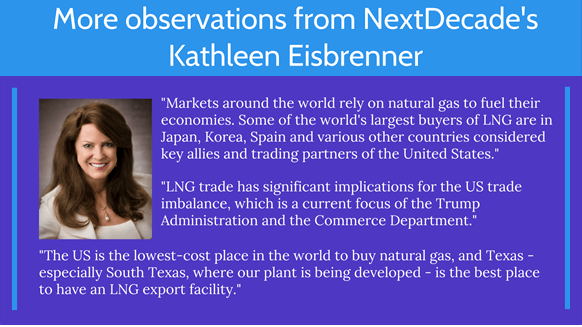 NextDecade’s founder and CEO, Kathleen Eisbrenner, contends that her company is well-positioned to prosper in the next LNG generation. “We believe that NextDecade is a leader among the second wave of LNG projects in the United States and that our projects offer potential customers a prime opportunity to secure reliable, low-cost LNG from the United States,” Eisbrenner told Rigzone in a recent interview. Read on for more of Eisbrenner’s insights on the evolution taking place within the LNG sector. NextDecade’s proposed Rio Grande LNG project will boast a nominal output capacity of 27 mtpa (six 4.5-mtpa liquefaction trains), putting it on par with some of the largest LNG projects proposed or under construction in the United States, says Kathleen Eisbrenner. However, she added the project will be competitive under a range of output scenarios. Eisbrenner added that Rio Grande LNG will apply time-tested engineering – something she contends sets the project apart from other second -wave projects. “NextDecade remains committed to a ‘no-novelty’ approach, utilizing proven, understood and safe design and technology to provide customers around the work with flexible solutions for low-cost, reliable LNG,” Eisbrenner said. Rigzone: What do you see as the key characteristics of the first wave vs. the second wave of LNG developments? Eisbrenner: The first wave of U.S. LNG exports is typified by brownfield conversion projects – taking pre-existing import terminals and adding liquefaction capability and other necessary infrastructure improvements, so that they can export LNG. Existing U.S. LNG import terminal owners/operators have added liquefaction/export capabilities as a means of adapting to the rapid growth in the global LNG market in the short-term. However, there is only a finite number of existing LNG import terminals that can and will be converted to export facilities, and that number is not enough to satisfy future demand – this is where the second wave comes in. The demand that made the first-wave viable has not dissipated, it has kept growing and prevailing research indicates strong, long-term growth will continue to drive a second wave of projects. New, greenfield projects have a number of benefits including made-for-purpose design, and its associated cost and production efficiencies, as well as the ability for developers to select advantageous site locations with proximity and access to gas supply, among others. NextDecade’s proposed Rio Grande LNG export terminal at the Port of Brownsville is a prime example of the second wave of U.S. LNG export projects. This potential 27 million ton per year (mtpa) LNG export facility is currently in the advanced stages of the regulatory approval process with the U.S. Federal Energy Regulatory Commission and hopes to receive all necessary approvals by mid-2018, allowing for a final investment decision later that year and first LNG in 2022. NextDecade has worked collaboratively with its industry-leading partners to maximize efficiencies and reduce costs to the point where we believe we will be in a position to provide some of the lowest-cost LNG globally and be a leader of the second wave. In addition, our Texas location provides proximity and access to some of the most abundant and lowest-cost natural gas reserves in the world, including the Permian and Eagle Ford Shale basins, among others. Rigzone: What’s driving the transition from first to second wave? Eisbrenner: Strong global demand growth coupled with a surge in abundant, low-cost domestic supply is driving second-wave projects, like Rio Grande LNG, forward. We believe the U.S. Gulf Coast is the most reliable and competitive geography for greenfield LNG projects in the world. Organic LNG demand growth – Existing LNG importers, on aggregate, are continuing to grow and their demand for LNG is increasing. New and emerging market growth – new and emerging LNG import markets are rapidly developing, thanks in large part to FSRUs providing low-cost, flexible import solutions. These markets present an opportunity for NextDecade as they look to secure cleaner, reliable fuel sources to drive their economies. Roll-off contracts – through 2030, close to 200 mtpa of existing LNG contracts will expire and be up for renegotiation. In many cases, historical suppliers are not in a position to renew these long-term contracts for a variety of factors ranging from diminishing supply to geopolitical or security concerns. So not only is new demand a factor, but existing LNG demand will present an opportunity for the U.S. and companies leading the second wave to take advantage of. Crucially, without new projects, significant demand growth over the next decade will result in a global supply shortfall in the early 2020s. Because of the substantial lead-time needed to bring online new liquefaction capacity, it is essential that new investment decisions are made in the near term, which means new contracts must be signed so that this supply shortage and its resulting price impact can be avoided. Rigzone: Do you see opportunities for projects such as yours to go beyond a regional focus to, say, customers in Asia and Europe? Why or why not? Eisbrenner: Absolutely. NextDecade believes LNG demand will rise over the coming years, driven by widespread interest in cleaner-burning, higher-yielding fuels, increased coal and nuclear plant retirements, geopolitical considerations, and burgeoning demand from new buyers. In addition, we believe traditional LNG buyers are seeking to diversify away from oil-linked contracts and are looking to increase destination flexibility; as a result, low-cost U.S. LNG is poised to capture market share, supported by the country’s abundant gas supply—particularly, in the case of NextDecade, access to low-cost and abundant associated gas from the Permian Basin and Eagle Ford Shale—existing pipeline infrastructure, geopolitical trade considerations and a competitive project execution environment. Asia and Europe both offer compelling opportunities, for varying reasons. Strong political and trade ties help make U.S.-produced LNG an attractive option for many countries throughout these regions. In addition, U.S. LNG exports provide an opportunity to address existing trade imbalances. Lastly, geopolitical and energy security considerations may also play a role, particularly in regard to Europe. For another perspective on LNG's second wave, read this Rigzone interview with LNGL's John Baguley.